In my prior post I noted that the labor force of New York City, which had been soaring for years due to an influx of job-seeking young adults from around the country and around the world, suddenly fell from May 2015 to May 2016. I also noted that as I wrote reports on metro area economies and commercial real estate markets over the past few months I found the same trend – labor force growth slowdowns or outright declines – elsewhere. To try to figure out what was going on, I downloaded a quick table of the change in the metro area labor force from May 2014 to May 2015 and from May 2015 to May 2016 for metro areas around the country. The data shows growth slowdowns and in some cases outright declines for some of the economically strongest – and most expensive – metro areas in the country. And faster labor force growth, or in one case a shift from negative to positive, in some places that are cheap, even those that have had weak economies over the past decade. The data, which also slows the change in the number of employed residents and the unemployment rate by metro, may be found in this spreadsheet. Note the Series IDs. If anyone wishes to repeat this analysis in the future they can copy and past those same IDs into the “Series Report” tool in the “Data Tools” portion of the Bureau of Labor Statistics website, and get data for other and future months. Choose “multi-series table” and the data will come out in the same order. It will not include the names of each metro, but if you drop it into the same place in this spreadsheet it will be correct. The metros with large labor force slowdowns includes some energy-driven metros where employment growth has slowed or gone negative – Houston, Oklahoma City, Tulsa – and a couple that have had a modest recovery from the Great Recession – St. Louis, Kansas City. For the most part, however, these are the metros that fared the best during and in the wake of the Great Recession, in large part due to an influx of young workers. In addition to falling in metro New York, the labor force shrunk from May 2015 to May 2016 in metro Los Angeles, Miami, Washington, and San Diego. All places with strong employment growth and, until recently, a growing labor force. Labor force growth has stalled in America’s most booming metro area, the Bay Area of San Francisco-Oakland-San Jose, and slowed in similarly booming metro Boston, Charlotte and Raleigh-Durham. With job growth continuing, for now, at least for now, the unemployment rate in many of these metros is falling rapidly, and in some cases has fallen below 4.0%. But job growth seems set to stall not because of a shortage of jobs, but because of a shortage of workers. In the West Bay section of the Bay Area, for example, the unemployment rate is now just 2.8%. But because of high housing costs, people have stopped coming. And yet because of an apartment development boom, and because many young people have stopped coming, rents have started to stabilize and fall according to press reports. Anecdotally, a friend of one of my children moved there last year, after receiving a “fellowship” to write part time for a Bay Area publication. It was what she wanted, but how could she manage in a place where tech workers pay half their salaries in rent? Surprisingly all of a sudden she was able to find a place to live (with roommates) that she could afford, something that would have seemed impossible even a few months earlier. And then her position was upgraded to full time “freelancer.” Given Bay Area rents her non-employer is lucky to have her. At those apartment rents, in fact, they are lucky to have anyone. How about metro areas where the labor force increased faster from May 2015 to May 2016 than it had from May 2014 to May 2015? These include some long booming metros such as Austin, Denver, Portland, and Dallas-Fort Worth. (Other strong growth metros where the labor force is still increasing rapidly, although not quite as rapidly as before, include Atlanta, Phoenix and Minneapolis-St. Paul. Although employment growth may be about to halt in the Twin Cities, as a result of an unemployment rate of just 3.2%). These metro areas are cheaper to live in than those where labor force growth is slowing. Even places that have become expensive relative to the U.S. average, such as Austin, Denver and Portland, are still cheaper to live in than California, where many of the young people who are moving in come from. Also on the list, surprisingly, are a bunch of Midwestern metro areas better known for economic stagnation and state and local government fiscal distress. Leading the list is Chicago, generally thought to be an aging rustbelt area but one nonetheless attracting strong labor force growth. Despite strong employment growth, the unemployment rate there is still above 5.0%. Metro Detroit’s labor force had fallen for years as it experienced something like the Great Depression from 2000 to 2010, and it increased by only 1,888 from May 2014 to May 2015. But it increased by 45,396 from May 2015 to May 2016. Cleveland’s labor force has also started to grow, albeit more slowly, and Cincinnati’s swung from a small year-over-year decrease to a small increase just in the past year. 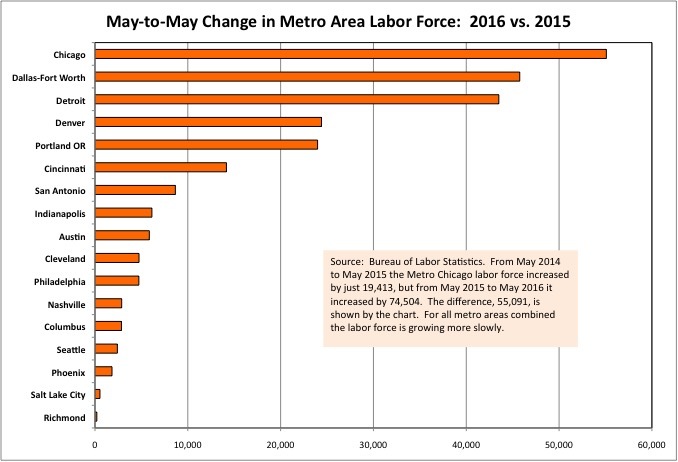 The metro Columbus labor force expanded more rapidly in the year to May 2016 than in the year to May 2015 as well. It will be interesting to see if those additional workers, some of whom will have just moved, will register and vote in the November election. And metro Philadelphia’s labor force growth was strong in the year to May 2015 and has gotten stronger since, perhaps due to the city’s ability to attract young people priced out of Brooklyn. That is a pattern that has repeated in every housing bubble, only to disappear once the bubble burst and New York City became more affordable. This time the city of Philadelphia has had a larger increase in young adults as a share of the population than any other city, according to one analysis, although it remains to be seen if they will stay. As I’ve noted this data source is volatile, can be inaccurate, and is subject to revision. Is there a real-time indicator that might show where young adults are leaving, and going? How about rail transit ridership? According to the NY MTA website, monthly budget data, fare revenues are coming in below expectations. Page 49. Total ridership in May 2016 of 209.3 million was 4.6 million trips (2 singulair drug.1 percent) below budget. Average weekday ridership in May 2016 was 8.1 million, 1.3 percent lower than May 2015. On the subway (page 53) May 2016 weekday ridership was 43,000 (0.7% lower than the previous May, with a drop of 225,000 (3.7%) in the weekend. The former may be caused by fewer younger employed residents of the city, and the latter by deteriorating service. According to the report mean distance between failures for subway cars, the great measure of the transit system’s recovery from the devastation of the 1970s, is now getting worse month after month and a 12 month moving average. Generation Greed politicians, concerned they and theirs may not have sucked all they could out of the NY area before moving out or dying off, should be happy about that. New York’s public unions may be happy too. Having ordered their state and local politicians to irrevocably award them sky-high labor costs despite low starting pay, perhaps the public sector is experiencing a labor shortage of its own. With more and more money going to those not working – retired, shorter work weeks and years, shirking – and thus less and less work for more and more in taxes paid or diverted from other needs. Between the public unions and contractors, the real estate industry’s rising rents (for those who are not long time residents with special deals such as rent regulation) and the costs inherited from Generation Greed, no wonder others want to run away. On the other hand in Philadelphia, where the transit system is collapsing due to an even longer era of neglect, one also finds failing ridership for the city division of transit. Passenger revenue for the month of May was $748 thousand (or 2.6%) lower than budget. For the eleven months of Fiscal 2016 total passenger revenue was $7.9 million (or 2.9%) lower than budget. Fortunately for young workers moving to the city of Philadelphia, however, that city is small enough that one can walk or at least bike to work quite easily. Particularly from the neighborhoods young workers are moving to. Rail ridership remained at 2015 levels in April. Year-to-date, weekday rail ridership has risen 1.6%, while Saturdays ridership has increased 0.2% and Sundays has climbed 0.6%. Ridership in April increased on the Red, Blue, Orange, Brown and Green Line South Elevated lines. Bus ridership is falling in Chicago, as that transit agency is also in a service-cut death spiral as a result of Generation Greed policies. The young want transit, but those older (who generally did not) have taken it away from them – with debts, inadequate maintenance and capital investment, and retroactively increased and spiked and underfunded pensions. Better buy a bike and good winter clothing and rain gear to go with it, kids. And hope that some aging “real American” driving their vehicle doesn’t screw up and run you over. What is likely to happen in places with low unemployment and limited, or even negative, labor force growth? Perhaps businesses will raise wages to poach each other’s workers. That would mean higher prices if they can force their customers to pay, and lower profits if they can’t. Perhaps those businesses that can’t or won’t raise wages will relocate operations to places where workers are still available. Google, for example, is headquartered in the Bay Area – but is growing in Chicago for a reason. Perhaps more jobs will leave the U.S. entirely. Youth unemployment is still high in much of Europe, for example. For activities serving the local market, and for businesses that don’t want to move, perhaps they will turn to two types of people that are less likely to be working than in the past – the over 55, and teenagers. The former, if retired, might be interested in working again, but perhaps only part time. The latter generally only work part time, and are difficult to train. But teenagers were far more likely to work before 1980, and seniors before 1970, than they are today. There is yet another possibility, but I’ll let Trump and Clinton argue about that one. With the Baby Boomers now age 52 to 69, and last of the large cohort of their children moving out of school and into the workplace, the U.S. is facing a new era of labor scarcity – both at the entry level and among those with acquired knowledge and skills. Some economists blame the loss of skills to retirement, along with limited business investment, for the U.S. labor productivity slowdown. This is a loss of productive capacity for a country that was already living beyond its means, and spending more than it earned, and importing more than it exported, back when labor force participation and investment were at their peak. In this new era workers will have more choices, if not higher incomes (and certainly not higher net incomes due to all the costs inherited from Generation Greed), something that will play out differently from one metro area to another. During the past few years, when tens of thousands of college-educated young adults were streaming to New York from economically devastated areas in the Midwest, snobby “Real New Yorkers” commenting on sites such as Gothamist would tell the “Hipsters” that they should “go back to Ohio.” Now, it seems, many are doing so. Once they are gone, the “Real New Yorkers” may be disappointed to find that those who leave will no longer pay New York City and New York State taxes while receiving little (and less and less) in return.